The last post on the blog, Intro to Aperol, by Audrey Saunders at Pegu Club, got me thinking about the name sake of that establishment: the orginal Pegu Club, in Burma. 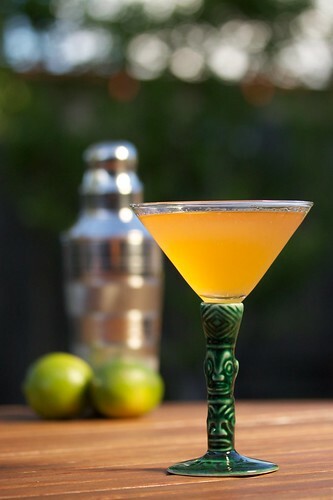 The 1930 edition of Harry Craddock’s The Savoy Cocktail Book (I have the reprint edition) describes it as “The favorite cocktail of the Pegu Club, Burma, and one that has travelled, and is asked for, round the world.”. Well, who am I to question Harry Craddock. If you have really great friends, use a Martiki glass. Otherwise, go with a regular cocktail glass. This is another one of B and my favorite cocktails. It really is one of those “tastes of summer”. You can see why it would be popular among the denizens of the Pegu Club in Burma.